My partner Carole and I are avid foodies who love sharing all things to do with food. Our love of sharing recipes and food experience brought us together on the BBC Food boards which no longer exist due to cuts in the BBC budget. We have since got together and now want to share our recipes and experiences with you. We are always looking for new recipes and food experiences from around the globe and you can also join us in our quest with like-minded foodies at http://www.carta.co.uk where you will find a friendly community who love to talk about everything food related. Curly Kale with Smoked Sausage. When living in Holland I would eat this simple peasants winter dish during the colder months. It is a real winter warmer and can certainly be classed as comfort food. Start by peeling the potatoes and cutting them into even sized pieces ready for boiling, cut the stalks out of the kale leaves and then chop into pieces. Boil the potatoes and kale in salted water until cooked, you can either put them both in the same pan or cook them separately. I prefer to cook them separately to keep the potatoes nice and white. Fry the bacon lardons in a dry pan until crisp and golden, then drain onto a piece of kitchen paper. When the kale is almost cooked place the smoked sausage on top to heat it through, the smoked sausage is already cooked but does need heating up for this recipe. When the sausage is hot drain the potatoes and mash them together with a little butter to taste. Drain the kale and add to the potatoes mashing again to get the potatoes and kale through each other. Serve the mash on a warm plate and place slices of smoked sausage on top, then sprinkle with the bacon lardons. You could arrange the slices of sausage across the mash if you wanted to, but there is no real way to make this dish look pretty. It is after all a peasants meal, but very tasty nevertheless. Pour gravy onto the plate, and there you have it.....Dutch Boerenkool met Worst. The Dutch often make an indentation in the middle of the mash and pour the gravy into it. Labels: Curly Kale with Smoked Sausage. This is one of my favourite dishes and has been tried and tested by people who have read my recipe on different food forums. 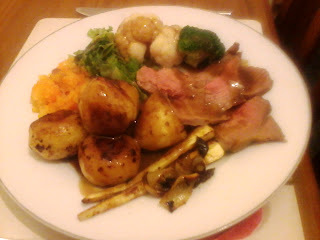 This one also comes with a delicious home-made pepper sauce. 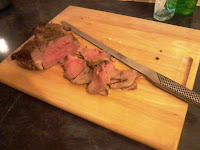 Cut slits into the tenderloin about 2 cm apart and about ¾ of the way through. Crush 2 cloves of garlic and add 1 tsp of rosemary together with a little olive oil.Rub the mixture all over the tenderloin and set to one side. Next peel, wash and cut the potatoes into chunks, cut the mushrooms into halves or quarters depending on the size and peel and slice the onions. Gently fry the remaining garlic in a pan with olive oil and butter to add some flavour and then remove it from the pan, then sauté the potatoes in the garlic infused oil and butter. Fry the mushrooms and onions when the potatoes are almost cooked. To cook the tenderloin simply pan fry it in hot olive oil and butter until it is brown all over, then transfer it to a hot oven 150°c for 10 mins. After 10 minutes remove the tenderloin from the oven and place on a warm plate and cover with foil to allow the meat to rest. 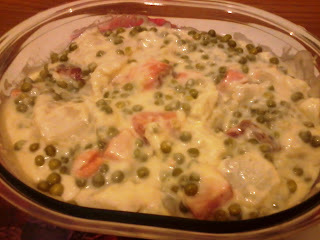 Put the peas on to cook whilst the meat is resting. Now it's time to make the sauce using the same pan that was used to pan fry the tenderloin. Quickly fry off a few finely chopped mushrooms in the meat juices, grind a teaspoon of whole peppercorns in the pestle and mortar and add to the juices of the pan, then cook the crushed peppercorns for about 1 min. add a splash of water to slightly de-glaze the pan, followed by about 3 to 5 tablespoons of dark soy sauce. Allow to reduce ever so slightly slightly, remove from the heat and then add double cream to get the texture of pepper sauce. Whisk everything together over a low heat and serve over the tenderloin or transfer the sauce to a warm gravy boat for self service. There you have it, pork tenderloin with sautéed potatoes, mushrooms, onions and peas in a pepper sauce. Beef stew has to be one of our favourite Autumn/Winter meals. Everything used is seasonal which makes it a cost effective and hearty meal. Remove excess fat from the beef and cut into chunks and roughly dice the onion, then brown the beef in a little oil and add the onions until they are soft. Add about ½ a glass of full bodied red wine and allow to reduce. 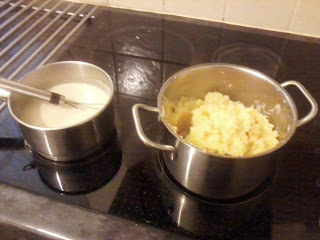 Then add the flour to make a roux followed by the beef stock and about ½ a litre of boiling water and the gravy browning. If the gravy is too thick add more water and then cover the pan and allow everything to cook on a low heat for 2 - 2½ hours until the meat is tender. Meanwhile chop all the vegetables into chunks and when the meat is tender add the carrots and swede to the pan and cook for another 10 mins. before adding the celeriac and parsnips. If you are using waxy potatoes you can add them now as well, but if you are using floury potatoes allow evferything to cook for a further 10 mins. before adding them. Cover the pan and allow your stew to cook on a low heat for a further 30 - 40 mins. or until all the vegetables are cooked. Serve in a warm dish with some crunchy bread rolls on the side if desired. The stew can be made before hand and left overnight in the fridge to reheat and serve the next day. Some prefer it served the next day as all the flavours get a chance to infuse overnight and intensify the taste of the dish. One of the things we are frequently asked especially by visitors from abroad, is how to make a traditional British roast dinner, or as it is more affectionately known, the Sunday roast. This is always a favourite with our kids when they come to visit, so this one is for the four of them so that they can recreate it themselves at home. 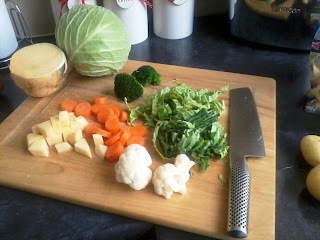 Most important of course are the fresh ingredients. We used Maris Piper potatoes, cabbage, swede, carrots, parsnips, cauliflower, broccoli, onion, garlic, rosemary and thyme. 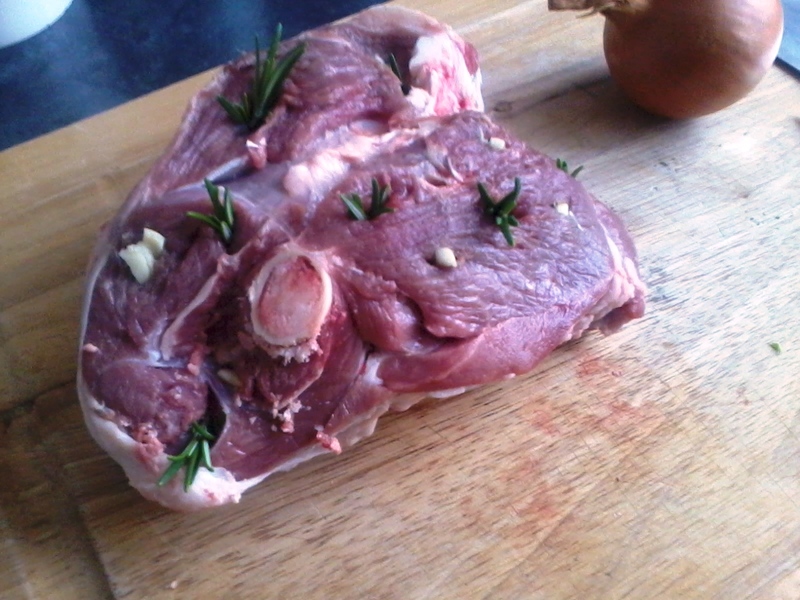 The meat was half a leg of Welsh lamb which I studded by cutting slithers of garlic and sprigs of rosemary and then using a sharp knife cut slits into the lamb and inserted the rosemary and garlic. 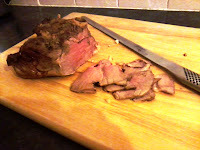 You can of course use your favourite meat for this recipe such as pork, beef, chicken which you don't need to stud. If you want to know how I prepare pork, beef or chicken for this meal please leave a comment and I will post the method there. Start by peeling the potatoes and then par boil them for about 5 mins. in salted water whilst you stud the lamb, then drain the potatoes keeping some of the water in a jug. Let the potatoes steam dry. 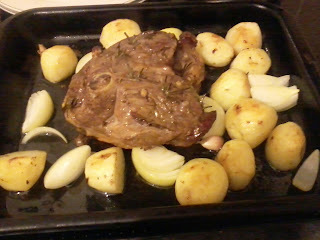 Place the lamb in a roasting tin and put into a pre-heated oven (180c) whilst you peel the onion and cut it into chunks. Take 4 or 5 cloves of garlic (no need to peel) to flavour the oil in the roasting tin. Add the potatoes, onions and garlic to the roasting tin and toss everything together to coat in the oil and juices that have now started coming from the lamb. 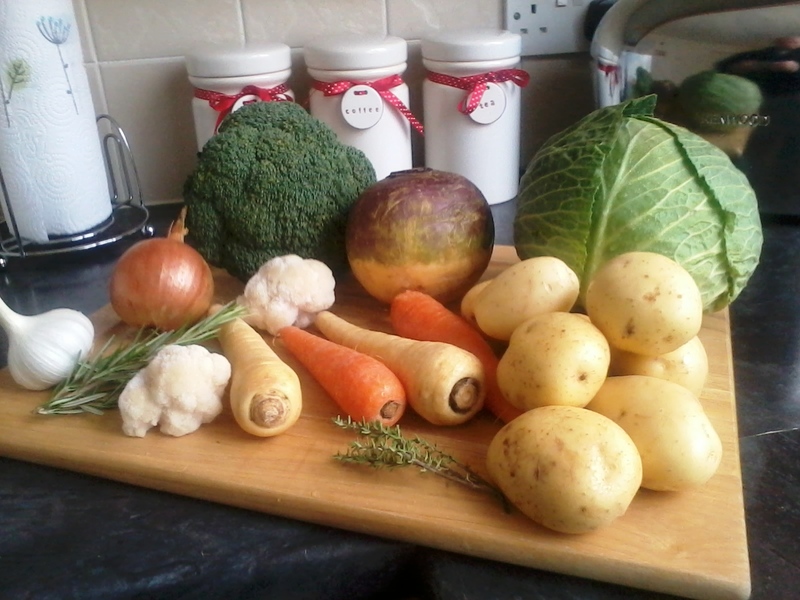 Now it's time to start with the vegetables and because one of the hardest things is to get the timings right we are going to pre-cook the vegetables and finish them off in the microwave so that everything is ready for dishing up at the same time. Peel the carrots and swede and cut into even sized chunks and boil in salted water for about 10 mins. or until soft enough to mash together. Meanwhile remove the stems from the cabbage leaves and wash the leaves under cold running water. Roll the leaves together into a cigar shape and cut the leaves into strips. Cut the cauliflower and broccoli into florets and cook in salted water until they are slightly undercooked, then remove them from the water with a slotted spoon and place into a microwaveable dish. set the water in the pan to one side as this will be used later to make the gravy. Boil the cabbage in another pan of salted water for about 5 mins. so that it doesn't overcook and still has a bit of bite to it, then drain the water and put the cabbage in the dish with the cauliflower and broccoli. Drain the carrots and swede by pouring the water into the same pan as you cooked the cauliflower and broccoli, so now you have your vegetable water ready to make the gravy. Mash the swede and carrots together with a potato masher and add the to the microwavable dish together with the other vegetables. Now make the gravy by pouring off about 4 tablespoons of roasting juices from the roasting tin into a saucepan and add about 2 heaped tablespoons of plain flour. Stir on a low heat to make a roux and allow it to bubble to cook out the flour, then gradually add the vegetable water whilst stirring all the time to get the consistency of the gravy you want. Now add 2 (lamb) stock cubes to the gravy and a splash of gravy browning. Stir well and allow to simmer on a low heat. Next peel the parsnips and cut them lengthways into quarters, remove the lamb from the roasting dish and put on a chopping board, then cover it with tin-foil and allow to rest. Put the parsnips in the roasting tray together with the potatoes and return the tray to the oven. Once the parsnips are cooked, place your dish with vegetables in the microwave and heat on full power for 1 to 2 minutes, depending on the power of your microwave. Carve the lamb into thin slices, it should still be pink on the inside for maximum flavour and texture. 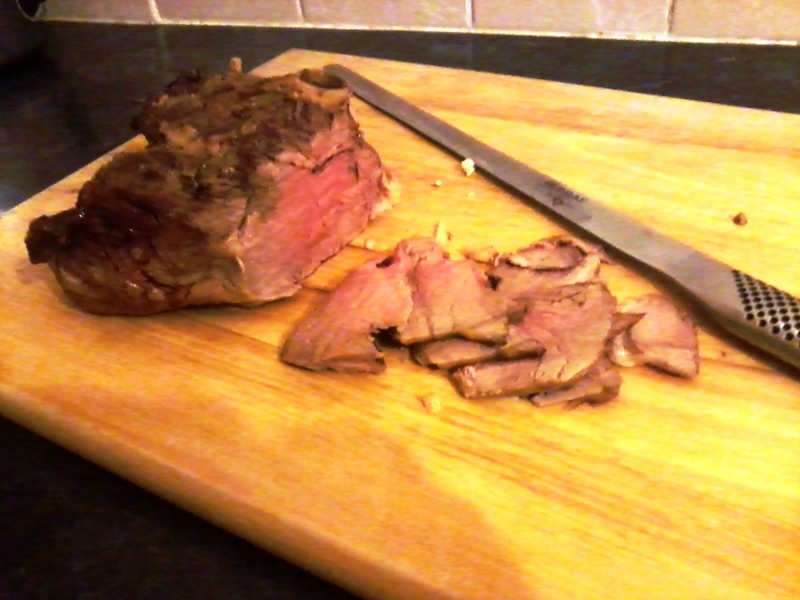 Ours was cooked in 1 hour, but you can leave yours in there whilst the parsnips cook if you prefer it well done. Plate up everything from the roasting tray and the vegetables from the microwave, place your slices of lamb on the plate. Check the gravy for seasoning and add a little salt if required, although the vegetable water used to make the gravy should have enough salt in there already. Pour the gravy onto your finished dish and serve immediately. 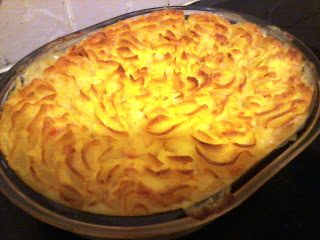 As this is the first entry I thought by way of experiment to post our recipe for fish pie which we had yesterday. 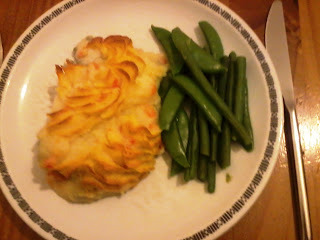 It's one of my favourites with a delicious crusty potato topping and the fish cooked to flaky perfection. The first thing to do is boil some potatoes with a few carrots in salted water to make a creamy mash by adding a knob of butter to the potatoes just before mashing. Mashed potato and bechemel sauce. The bechemel sauce is made by melting a knob of butter and adding flour to make a roux. Then add milk as you stir to avoid lumps. Season with a little chicken stock or salt if preferred. A dash of white wine finishes it off beautifully. At this stage you can allow the bechemel sauce and the mashed potatoes to cool as they will be finished off in the oven once they are combined with the the fish. Next select the type of fish you are going to use in your fish pie. 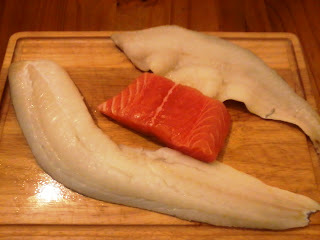 We have chosen cod, salmon and haddock. You can used smoked fish for this recipe, but we used unsmoked. From top to bottom, haddock, salmon and cod. Make sure that there are no bones in the fish, otherwise remove the bones using tweezers. It's now time to assemble the pie. Start by adding your pieces of fish to an oven-proof dish and add a handful of petit pois (optional). Pour over the bechemel sauce and gently mix everything together. Next pipe the mashed potato onto the filling making sure to fill all gaps. 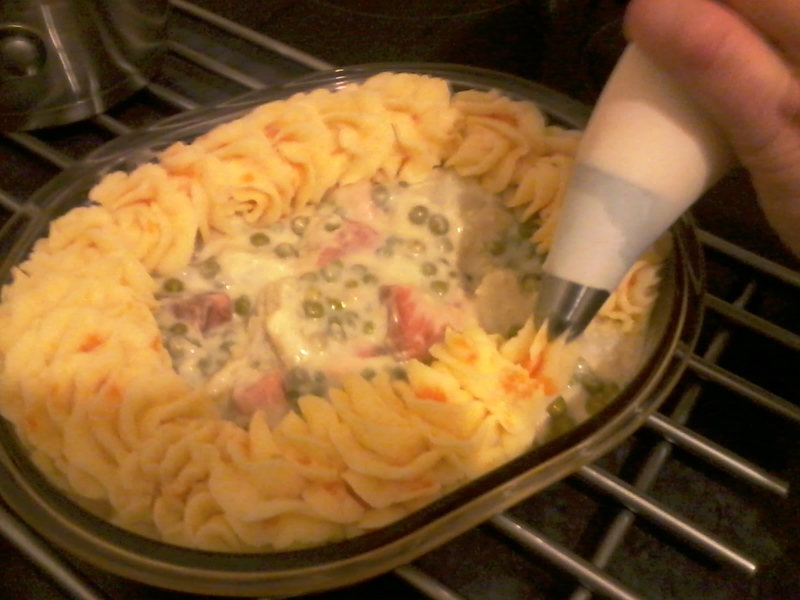 You can also do this by hand and then fluff the potato up with a fork if you don't have a piping bag. Place the fish pie into a pre-heated oven (180c) and bake in the oven for 40 to 45 minutes until the fish is cooked and the potato has a golden crust. We had ours with fine green beans and sugarsnap peas, but you can serve it with your favourite vegetable combination of course, or just have it on it's own. So there you have it, a delicious fish pie full of goodness and flavour. Pork Tenderloin with sautéed potatoes. Rump Steak with sautéed potatoes. Sausage bake with bell peppers. Copyright © 2012 All Rights Reserved.. Powered by Blogger.